I had today a day off work and wonderful sunshine which gave me the perfect light to finally photograph my one very beloved collection. My highlighters. I have to admit, i did not use highlighters until maybe 2 years ago and its just been several month since i have really fallen in love with it. Highlighters are a great way to brighten up a dull complexion and to achieve a wonderful dewy look in spring. I would call highlighters part of a bit more advanced make up look since you really need to know where and how to apply it because you will otherwise just end up looking like you just came out of the gym. However, it is not that difficult to use. Highlighter is applied on your cheekbones under your brows and can also be lightly dabbed on between your brows and on your cupids bow. If you glow in the dark, you have used to much ;). However, enough of the introductional talk and lets get to the goodies. I swatches all my highlighters for you and the swatches are labeled. A firm favourite of mine is obviously the bloggers favourite, the Mary-Lou manizer. However, this powder based highlighter is already one of the stronger ones and definitely easy to over apply for a day time look. However i love the light golden ness of this highlighter. A cream based highlighter which looks suprisingly similar is the darker shade of the sleek highlighter palette Renaissance Gold. Next to it you see the way brighter Platinum shade which is also creme based. There is two more hightlighters in the palette, however i have never used them as such but rather for contouring since the shade is for me more akin to a bronzer or a contouring colour (on my skin tone that is). One big suprise for me was the Essence so glow highlighter. This is also a cream based highlighter which gives a lovely rosy glow to your cheeks. It can be worn quite subtle but also build up for more effect. It seems to be coming colour wise rather close to the benefit high beam which is a highlighting liquid. I dare say that i prefer even the essence one since the benefit can be a bit tricky to apply. Not to speak about the price difference ;). Next to it you see the Essence sun club highlighter. I just swatched the highlighter part of the powder since it is a combined bronzer and highlighter. 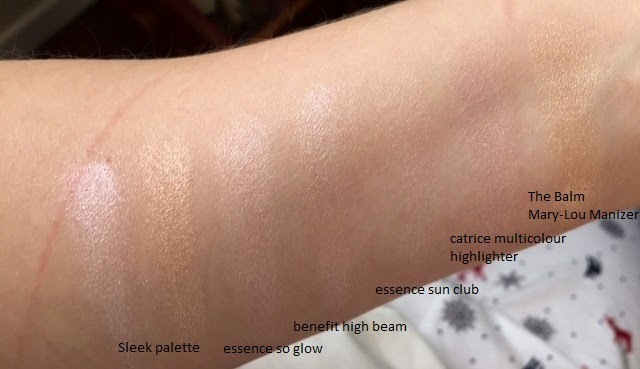 As you can see, this one as well as the catrice multi colour highlighter are very subtle and great if you want to carefully test the waters of highlighters. Those two are along with the Essence one also the by far cheapest though they are unfortunately limited edition. I personally prefer to wear rosy toned highlighters during the day and the golden shades for the evening. Though i sometimes just mix that up too if i feel like it (aren't i quite the rebel). My favourites are the darker sleek highlighter and the balm Mary-Lou Manizer for the evenings and the essence so glow for the day. Though i do use all of this products. The essence sun club one i barely use independently though since it is a bit so subtle for me. So i usually just apply it when i use the rest of this box too. 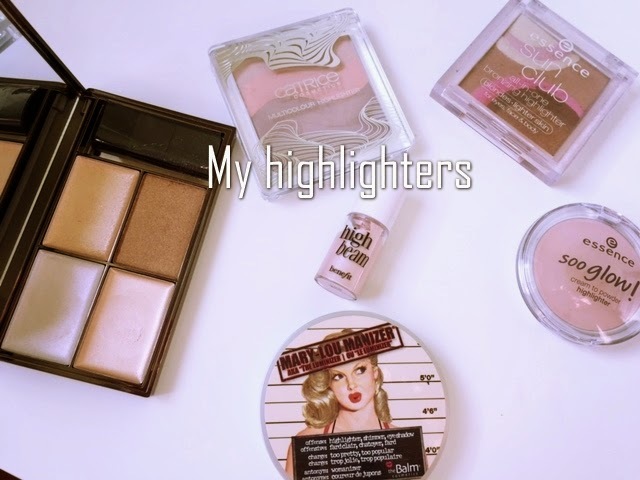 Which one are your favourite highlighters. Do you differ between daytime and nightime highlighters? Let me know in the comments. i just got high beam but i haven't used it much, my favorite has to be watt's up! I heard so many great things about watt's up. I definitely will have to give this a shot some time. Prachtige highlighters stuk voor stuk! :) Wat een leuke blog heb je trouwens, ben er net bij toeval op terecht gekomen.